Cranberry sauce is the perfect side dish for any holiday meal. It is great with turkey, stuffing, plain, or on leftover turkey sandwiches. Every Thanksgiving I make fresh cranberry orange sauce. I love the flavor the orange juice and zest adds to the tart cranberries. Every year on our Thanksgiving table we have my fresh cranberry orange sauce and a blob of jellied cranberry sauce from a jar. My brother loves the jiggly cranberry sauce that tastes like the can. I don’t know why, I can’t stand it. My dad likes to please everyone so we always serve both. My cranberry sauce is always a hit, while the blob usually only has one slice missing. Fresh cranberry sauce is simple to make. I love watching the cranberries burst when they start to boil. I add fresh orange juice and zest to compliment the cranberries. The sauce will thicken as it cools. I always make it the day before the big meal and chill it in the refrigerator. This classic cranberry sauce is a must make every holiday season. 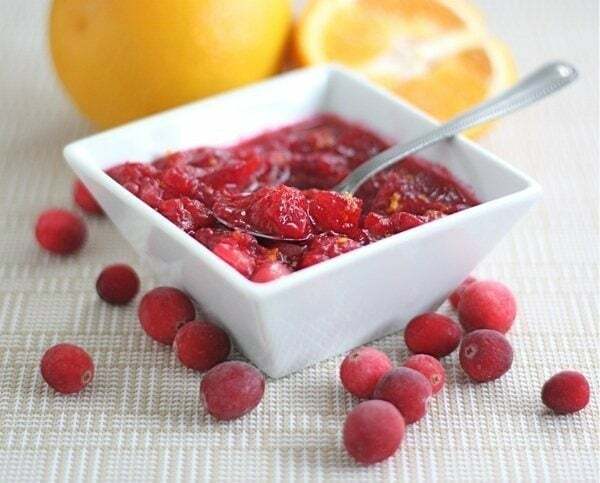 Skip the jiggly jar sauce and make fresh cranberry orange sauce this year. 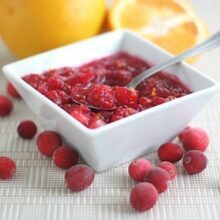 If you like this fresh cranberry sauce, you might like our Maple Cranberry Sauce too! 1. Rinse cranberries with cold water. In a medium saucepan, add sugar, water, and orange juice. Stir until sugar dissolves. Bring to a boil and add cranberries and orange zest. Return to a boil and then reduce heat to medium low. Cook until cranberries start to burst, about ten minutes. 2. Remove from heat and let cool to room temperature. Pour sauce into a serving bowl and chill in the refrigerator. Serve chilled. *Note-you can make the sauce 1-2 days in advance. It’s such a pretty color! I love cranberry sauce. I actually have an old school cranberry grinder that I use to make sauce. I’m so excited to whip it out this year. We usually add apples, oranges & walnuts to ours. It is my favorite part of the Thanksgiving meal!! I will have to try adding apples. Sounds great! This is such a staple in my house. Yum! This looks so great! Love how bright and pretty it is! I love orange with cranberry too. My boys all love the cranberry jelly lol. The color is gorgeous – and those photos! Wow. Gonna have to give this one a try – perfect for Thanksgiving. i make mine similar. this looks great. I made some last year! Love the combo. I have always loved cranberry sauce, even the canned kind, but when I tried Betty Crocker’s cranberry orange relish, I stopped looking further. I LOVE it. You don’t have to cook, only chop it up in the Cuisinart and let it sit a few hours or overnight. So fresh. My daughter makes it now, but she cuts the sugar way down. I have to admit, it’s still good, but it’s really tart! When she’s not looking I sneak in some more sugar. I use it to top ice cream when the turkey is gone. I’ve never made cranberry sauce with fresh cranberries, but I’m thinking this is the year I need to try it. i LOVE cranberry sauce. i could eat it plain, straight out of the bowl if i was allowed to! yours looks beautiful and delicious! I love the citrus addition to this sauce. Yum! This sauce looks wonderful, and so flavorful! I’d love to try it for my (small) Thanksgiving spread this year! Thanks for sharing. This just puts me in the holiday mood so much! Pretty color! This will be on my table for Thanksgiving! P.S. I got the tortillas yesterday… I can’t wait to use them. Thank you! Beautiful! I loooove the flavor combination of cranberries and oranges. I especially love cranberry orange scones. Mmmm! This is the same recipe I use! I grew up hating cranberry sauce as I only knew the jiggly canned stuff. This is the real deal! I am in TOTAL agreement! I always hated cranberry sauce because I associated it with the jelly in a can. Once I discovered the joy of making my own, though, I fell in love. It’s delicious. I grew up with the cranberry sauce in a can and didn’t know what I was missing until I started using fresh cranberries. I love how they burst also and so easy to prepare. I use orange juice/zest plus chopped apples. Homemade is the way to go. I will have to try chopped apples next time. Sounds great! 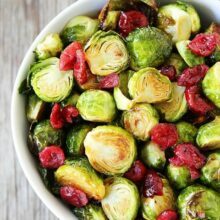 This is definitely my favorite way to make cranberry sauce! Cranberry and orange go so super well together. Love cranberry sauce of any kind. (Even the jellied kind that holds the shape of the can.) Has anyone tried to can their own sauce? It seems like this recipe would work well preserved. Any recommendations? I am with you, Maria – I made fresh cranberry sauce last year when I hosted Thanksgiving and I’m never going back! oh i love this. sometimes i really think cranberry sauce might be my favorite part of thanksgiving. I love fresh cranberry sauce! Your pictures are gorgeous! Cranberry and orange. That sounds so bright, cheery and sunshiney! i love it! I don’t like cranberry anything. If I come to your house can I just get a glass of milk and a dozen Oreo cookes? Uncle Paul if you come visit you can have whatever you want:) Let us know if you need help with anything. We can come up sometime! Love fresh cranberry sauce. This looks delicious! This looks delicious, easy-to-make AND I can make it in advance! Adding this to my Thanksgiving menu. Thanks Maria. …And what is it about there being one person in every family that likes canned cranberry sauce? ICK! I just don’t get it. That look so good maria! 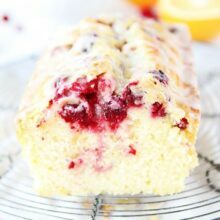 Love the combination of cranberries and oranges. Also great together in drinks too! I’m definitely making this for Thanksgiving. Soooo pretty. I always loved the jellied cranberry sauce. Then two years ago I made homemade and have never looked back. I don’t have a “go to” recipe so I’ll give yours a try this year. I’ve always been a fan of the relish. It’s also easier as no baking is required and it just tastes fresh. I made this for Thanksgiving and it converted a few people to the non-canned kind. Yum! Even better on turkey sandwiches the next day. I love making homemade cranberry sauce. I, too, have found that adding in orange kicks the flavor up a notch! Looks so pretty! I’ve never tried to make cranberry sauce before. I think I might be adding something new to our dinner! I always make my cranberry sauce the exact same way. Same ingredients as you except for the water. And I grind them fresh- no cooking. It has to be amde at least one day ahead so the flavors can marry. Happy Thanksgiving. Trying this tomorrow morning for our first homemade cranberry sauce EVER. Happy Thanksgiving!!!! I hope you enjoy the sauce. Happy Thanksgiving to you! I just made this recipe and it smells yummy and tastes yummy! It was also fun with the cranberries cooking and popping. I know it is going to be hit for my Christmas Eve dinner tomorrow. Thanks for sharing your creative dish! Two Peas, Merry Christmas! Hi, was looking for similar as first tried when living 6 months in Steamboat Springs 2006-07. We bought cranberry/orange sauce from the salad bar at one of the supermarkets there and I was hooked! We don’t get fresh cranberries here so will be trying the dried ones which are still very juicy. Any day now! I am sure it won’t disappoint. 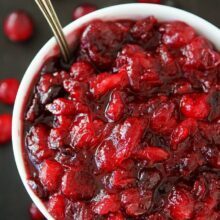 I’ve never made cranberry sauce, but I want to make it this year I ly problem is I’m diabetic any way I could make a sugar free version if it??? I LOVE this recipe! I make it every Thanksgiving and Christmas, and everyone raves about it! It’s so simple and smells amazing as it cooks! Not to mention that it’s sooo pretty! This year I made homemade cranberry jelly. I used an old pumpkin can that I had cleaned and let it sit in that overnight. I also sprayed it with cooking spray and then wiped out the excess. On thanksgiving I took a frosting knife and loosened it from the can and slid it onto a plate. It was as a hit. It was so easy to make, was so good, and even had the lines like the store bought stuff. It didn’t have the clear look of store bought jelly but it is so tasty. Maybe your brother and others would like this?! 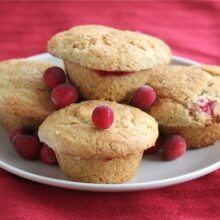 Bring 4 cups cranberries, 2 cups sugar, 1 cup water, 2 tablespoons lemon juice, 2 strips of lemon peel, and a pinch of salt to a boil. Reduce the heat to medium and simmer until the berries pop and the sauce thickens, 20 to 25 minutes; cool. Puree, then strain. Chill. This sounds so good. We have cranberries whenever I serve a poultry meal. I found this wonderful cranberry dip recipe that has apricot (or peach) jam and pecans served over cream cheese on Allrecipes site. I love cranberries whatever the season!! Hey, is there a way or a recipe to cut down on the sugar or substitute Stevia or something? Over half of us are diabetic now but we love cranberry sauce and feel so deprived-lol . Also that pie sounds fabulous but the same sweet problem there. Love your blog and your recipes! This was absolutely delicious. I don’t really like cranberry sauce but thought it was great. My mom (who does love it) raved about it, as did all of the other guests. Will put this in the permanent T-day recipe book! Thanks! I have made this for the last three Thanksgivings. Everyone loves it and it’s so fresh! This is my go-to recipe every Thanksgiving! So delicious! I usually add a bit of cinnamon and nutmeg in too. Everyone raves about it and there are never any leftovers. Thank you for a great recipe! 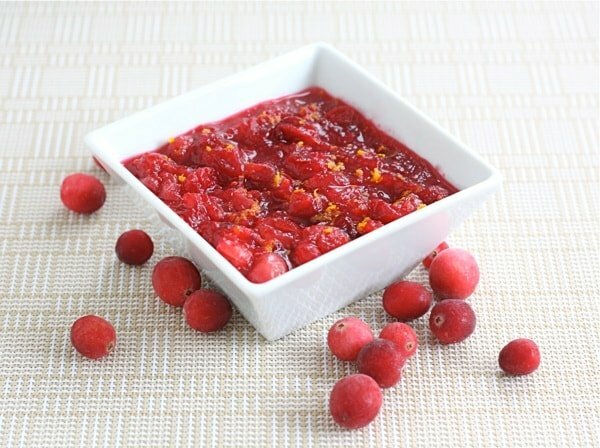 I enjoyed making and eating the cranberry orange sauce. I, too, will also try adding some apples next time.